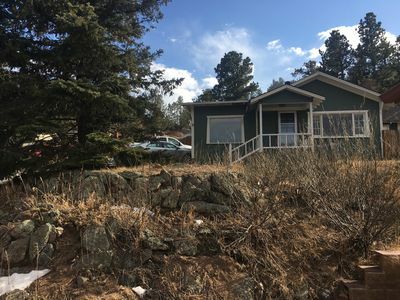 Remodeled May 2018 with new beds, furniture, kitchen and bathrooms! 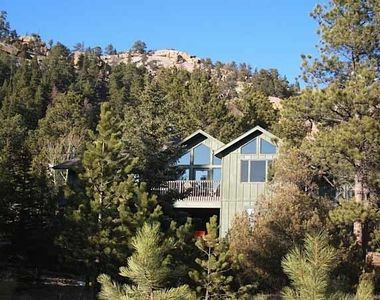 Whispering Pines Mountain Hideaway is the perfect family and hikers vacation destination. 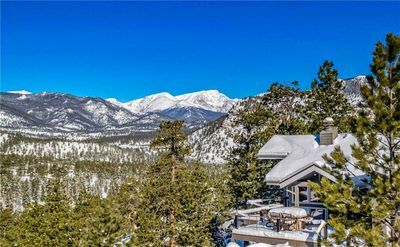 We border Rocky Mountain National Park on 6 acres just 5 minutes off Highway 7, and 20 minutes south of Estes Park. 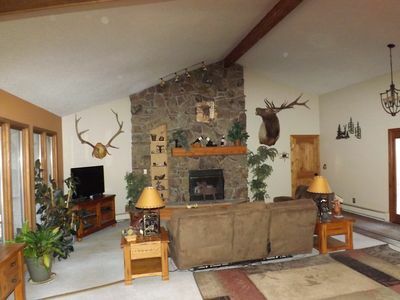 This home is very quiet and surrounded by forest and beautiful rock formations. 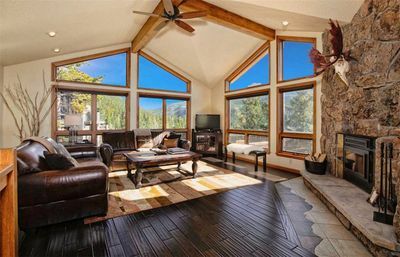 Overlooking the Tahosa Valley, and with no neighbors in sight, you can hike, enjoy the wrap-around deck, wander down to the stream on our property or just relax in the house sitting by a fire, reading a book, playing games or watching Netflix or Prime. The WiFi allows for receiving WiFi enabled phone calls, plus we have a land line phone for guest use. 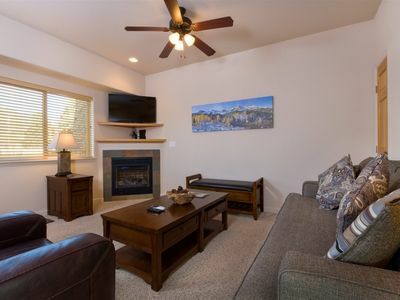 We have 2 flat screen 40 inch TVs, upstairs is a Roku TDL TV, and downstairs is a Samsung TV with a Roku stick. Note no cable or satellite channels at this time. Want to enjoy the mountains, but not be “stuck” in the mountains? 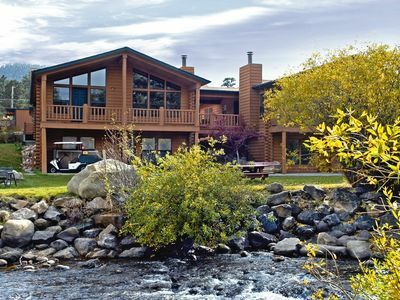 Whispering Pines is perfect. 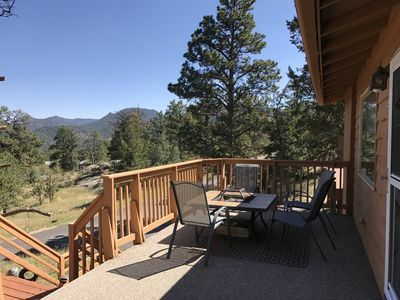 Secluded, it is also only 8 miles from downtown Estes Park where dining, shopping, entertainment and all kinds of activities are available. 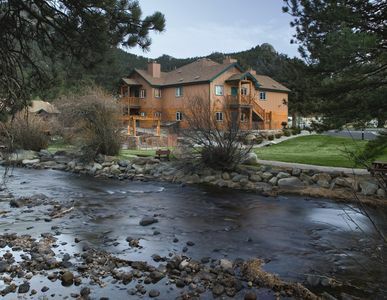 And if you haven’t visited Estes Park before, you will love it. 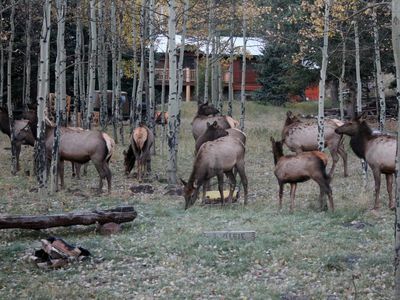 We enjoy many mountain dining choices when we visit. Do you prefer to hike, fish, golf or even horseback ride? All these activities are available nearby. 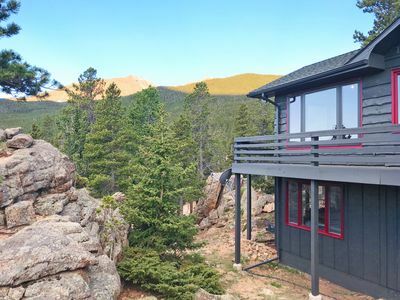 We are less than 200 yards from the new Storm Mountain Trail which connects to Estes Cone, Eugenia Mine and the famous Longs Peak Trail! 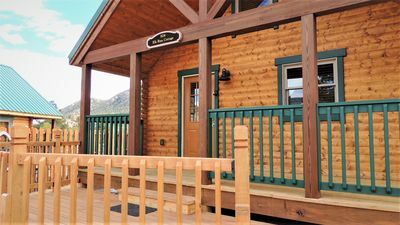 We love the drive down Highway 7 to the tiny hamlet of Allenspark, about 15 minutes away to the south. 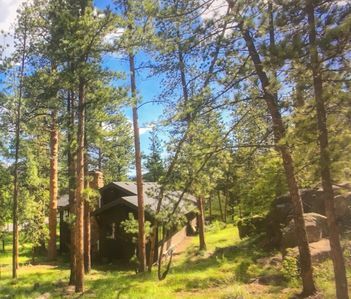 We are close to Estes' pioneer and Park advocate Enos Mill's cabin off Highway 7 and private tours can be arranged. 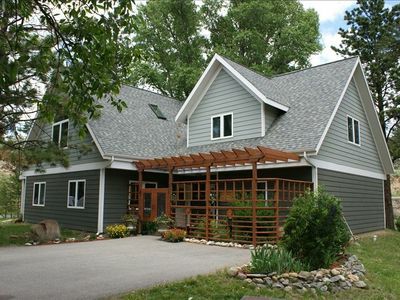 Also in Estes and Allenspark you can visit local art and craft shops. 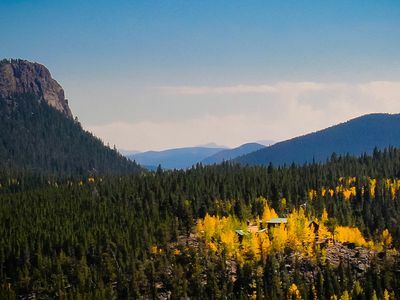 We are near to both the Longs Peak Trailhead and the wonderful Wild Basin hiking areas. 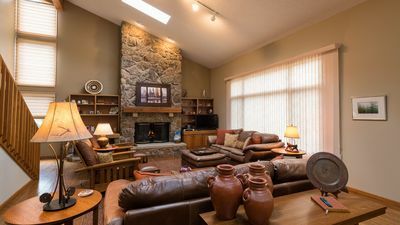 The best aspect of Whispering Pines Mountain Hideaway is how it makes you feel - refreshed, renewed and invigorated with the big views of the wilderness areas that surround us. We especially see birds in the forests around us, and hummingbirds enjoy coming around in the morning. 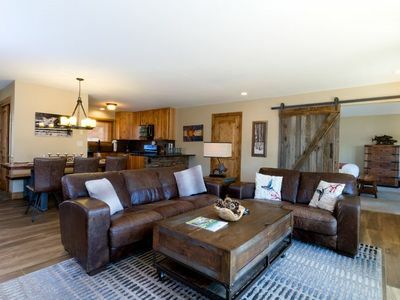 And when you do choose to be at home in our cabin, we provide all the essential comforts that you will need. 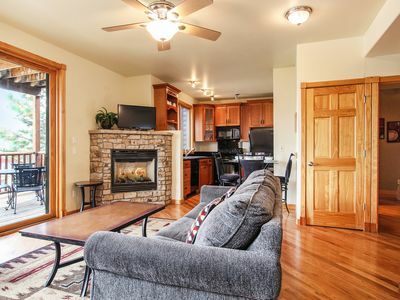 Relax by the fire in the living room, watch TV, play games in the dining room or take an inviting nap in one of the comfortable beds that await you. Want to enjoy a home- cooked meal? 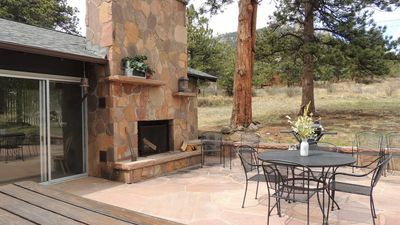 Our kitchen is ready for you, unless you would prefer to eat on the deck and enjoy the mountain scenery. We love our home. We know you will too. 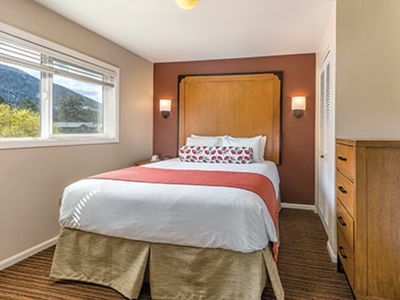 We hope you will come and visit us during your next stay in the Estes Park area. IMPORTANT NOTE DURING SNOW: This facility is available year-round subject to weather, however if snowy conditions exist, a 4 wheel drive or all wheel vehicle IS ABSOLUTELY NECESSARY. 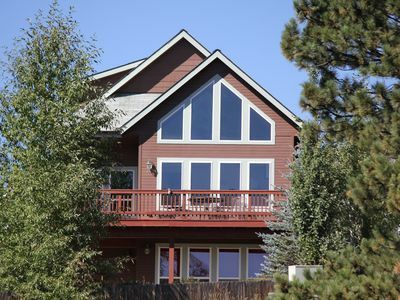 Situated on the Big Thompson River!